Priming compositions for firearms ammunition are mixtures which, when subjected to percussion, provide a sudden burst of flame that serves to ignite the propellant within the cartridge case. A priming composition must deliver a relatively large volume of hot gases and hot solid particles without the development of a detonating wave. The ideal priming composition would consist of a cheap, readily available, relatively safe to handle, simple chemical compound of uniform granulation which when subjected to impact would undergo rapid, highly exothermic decomposition. The only compound to even approach these specifications is lead dinitroresorcinate; however, it is far too sensitive. In practice, no single chemical compound meets all the requirements of an ideal primer. The next most desirable type of priming composition would be a mixture of compounds that, although individually nonexplosive, sensitize each other to ignition and rapid burning. In fact, most priming compositions consist of mixtures of one or more initial detonating agents, with oxidizing agents, fuels, sensitizers, and binding agents. The net effect of the additions is to dilute the initial detonating agent so as to convert its decomposition from detonation into rapid combustion. In some cases a single addition may serve two purposes, for example, antimony sulfide acts as a fuel as well as a sensitizer to friction, and gum arabic acts as a fuel and a binding agent. The oxidizing agents provide oxygen to support combustion of the fuel within the small space of the cartridge case. Fuels are necessary to prolong the combustion long enough to ignite the propellant. The additions may also serve to increase the volume of gases produced per unit weight of priming composition, to prevent the gases from having too high a temperature, and to contribute incandescent solid particles to the decomposition products. The sensitivity of priming compositions varies, but that of an individual composition can also be varied to some extent by careful control of the granulation of each of the ingredients. Sometimes this is more important than the proportions of the ingredients. Nonuniformity of composition due to physical separation caused by shaking can lead to great variations in sensitivity and even failure to function. The presence of a binding agent prevents such separation as well as fixing the composition in the desired position in the assembly. Generally speaking small arms primers consist of an explosive, an oxidizer, a fuel, and a frictionator. Other compounds act as sensitizers and binders. Explosives used include azides, fulminates, diazo compounds, nitro or nitroso compounds, for example, lead or silver azide, mercury fulminate, lead styphnate, TNT, and PETN (which also act as sensitizers). Oxidizers used include barium nitrate, potassium chlorate, lead dioxide, and lead nitrate. Frictionators used include ground glass and aluminum powder (which also acts as a fuel). Sensitizers used include tetracene, TNT, and PETN. Binders used include gum arabic, gum tragacanth, glue, dextrin, sodium alginate, rubber cement, and karaya gum. The quantity of oxidizer in the mixture is calculated to supply at least enough oxygen for the complete combustion of the primer; otherwise combustion products that are harmful to the firearm could be formed. (The fric-tionators could be regarded as sensitizers as they sensitize the mixture to percussion.) There may be more than one explosive, oxidizer, fuel, and fric-tionator in a single priming composition and sometimes a dye is added as an identifying feature or as an aid in production. Sometimes no single primary explosive is present, the mixture itself being the primary explosive. In 1805 the Reverend Alexander Forsyth used mercury fulminate as the basis of his primer composition, and from this time the percussion system developed into today's highly reliable, universally used, percussion primer compositions. This development which started in 1805 still continues today, and manufacturers are very reluctant to release details of their compositions. Consequently, information on primer compositions and the chemical composition of ammunition is both sparse and fragmented in the literature. Early priming compositions consisted of mercury fulminate and potassium chlorate along with other ingredients. With the introduction of metallic cartridge cases about 1850, it was found that brass cartridge cases were unsuitable for use with priming compositions containing mercury fulminate as the brass was embrittled due to mercury amalgamation of the zinc. This made the spent cartridge case useless for reloading purposes, and reloading was essential for economic reasons. Initially the use of copper cartridge cases solved this problem. In 1869, Hobbs, by the use of internal varnishing of brass primer cups and brass cartridge cases, made the use of brass and mercury fulminate possible by preventing the direct contact of the brass surface with the primer mix. Whenever black powder was used as a propellant, a large amount of fouling was deposited on the inside of the barrel. On combustion, black powder produces 44% of its original weight as hot gases and 56% as solid residues in the form of dense white smoke.48 When smokeless powders were introduced between approximately 1870 and 1890, another major problem was encountered. Smokeless powders were harder to ignite than black powder; consequently, larger priming loads were necessary for smokeless powders. Higher pressures were experienced with smokeless powders, and smokeless powders on combustion produced much less fouling than black powder. The relatively clean surfaces remaining in the barrel interior after the combustion of smokeless powder became rusted, even when the gun was cleaned immediately after use. The cause of the rusting was traced to the potassium chlorate used in the priming composition. Potassium chloride, formed after the combustion of potassium chlorate, was deposited inside the barrel; it then attracted atmospheric moisture and caused rapid rusting of the barrel interior. Gun cleaning mixtures were organic in nature and did not dissolve the potassium chloride; consequently, despite cleaning immediately after use, salt particles trapped in the rifling and surface imperfections of the metal still caused rusting. Water proved to be efficient at removing all traces of the salt; however, it was then necessary, and very difficult, to ensure that all the water was removed from the gun; otherwise the water itself would cause rusting. The heavy residue left after the combustion of black powder substantially protected the metal surfaces from the effects of the salt, and to some extent from the effects of metallic mercury released after combustion of the primer. The problems associated with the use of mercury fulminate and potassium chlorate led to a search for suitable alternatives, and the chemical reactions occurring within the cartridge case and the firearm were intensively studied. The objective of the study was to produce a satisfactory priming composition which was both noncorrosive and nonmercuric (NCNM). After a batch of damp sulfur and/or impure potassium chlorate (polluted with potassium bromate) caused "dead" primers in millions of rounds of ammunition with Frankford Arsenals FH-42 primer mix, this primer composition was abandoned. Frankford Arsenal adopted the Winchester Repeating Arms Company's 35-NF primer mix which was then standardized as FA-70 and was used in 0.45 ACP and .30-06 ammunition throughout World War II and into the 1950s. It would appear that the Germans were approximately 23 years ahead of the Americans in the production of noncorrosive primers, despite the fact that the German compositions were published in the open literature. This may have been due to patent rights. NCNM primer mixtures, it was not until the early 1950s that U.S. military ammunition became noncorrosive. This was because early NCNM commercial priming mixtures suffered erratic ignition and unsatisfactory storage stability, and as large quantities of small arms ammunition are stored as a war reserve, military ammunition must have unquestioned reliability and storage stability. In the United Kingdom both commercial and military ammunition used primers that were both mercuric and corrosive, until the gradual changeover to NCNM primers which was completed during the mid-1950s and early 1960s. The explosive ingredient in Sinoxyd-type primers is lead styphnate (lead trinitroresorcinate), which is very sensitive to static electricity, and fatalities have resulted from handling the dry salt. Preparation of the pure salt is difficult, and many patented preparations, including basic modifications, exist. Some claim special crystalline forms and/or reduced static electricity hazard. Explosive ingredient substitutes for lead styphnate were sought that would be easier to make and safer to use. These included lead azide, diazonitrophenol, lead salts of many organic compounds, complex hypophosphite salts, pic-rate-clathrate inclusion compounds, and pyrophoric metal alloys. In 1939 a primer mixture was patented that was identical to Sinoxyd except that diazonitrophenol was substituted for lead styphnate. Heat, humidity, and copper have a detrimental effect on diazonitrophenol and it is no longer used in primer mixes. Other substitutes for lead styphnate included lead salts of many organic compounds, none of which gained widespread acceptance. It was not until 1954 that preparation of the pure compound, normal lead styphnate hydrate, was accomplished. Up to this time the impure salt (~93%) was used extensively. When wet with water a reaction occurs between the calcium hypophosphite and the lead nitrate, producing a shock-sensitive nonhygroscopic compound which incorporates both oxidizer and fuel. Although this was a simple, relatively safe mixture, and was a satisfactory primer, it was discontinued after a very short period because of two major disadvantages. It was shown that copper, bismuth, silver, iron, and nickel increased the oxidation rate of red phosphorus to acidic compounds. Primer cups had to be zinc plated to prevent contact with copper. The red phosphorus had to be of high purity, and it was necessary to remove the major impurities (iron and copper) from commercial red phosphorus before use, and to coat the purified material with up to 7.5% aluminum hydroxide which inhibited oxidation. However, red phosphorus primers never achieved widespread use, presumably due to manufacturing difficulties. In the early 1960s important advances were made in the development of safer, easier to make, cheaper, and better substitutes for lead styphnate, which had been the main explosive ingredient in successful NCNM priming mixtures up to this time. An interesting stage in the development of primer mixes was the use of pyrophoric metal alloys, first patented in 1936 and improved in 1964. These rare earth alloys, as used in cigarette lighter flints, give a shower of sparks when lightly scraped. A typical pyrophoric alloy is "misch metal," which has the following approximate composition: cerium 50%, lanthanum 40%, other rare earth elements 3%, and iron 7%. Lead azide 20 to 25 oz. Powdered glass 20 to 25 oz. Flake aluminum 6 to 8 oz. Barium nitrate 35 to 38.5 oz. Trinitrotoluol 0 to 25 oz. Canada balsam or cellulose acetate 0 to 2.5 oz. m-Toluenesulfomethylamide 0 to 1 oz. Composition control is very stringent and ingredients are of analytical reagent quality. Mercury fulminate/potassium chlorate-based primer compositions are currently manufactured by some Eastern Bloc countries, although they also manufacture compositions based on lead styphnate. An interesting and extremely successful primer innovation was introduced by Eley and is known as Eleyprime. Instead of using lead styphnate, with its inherent safety and processing difficulties, Eley uses calculated amounts of lead monoxide and styphnic acid which are much safer to process. At the end of the processing stage a drop of water is added to each individual primer which initiates a chemical reaction between the lead monoxide and the styphnic acid to form lead styphnate. The final product when dry is no different from a conventional primer. In conventional ammunition lead, antimony, and barium are emitted when the ammunition is discharged. These three elements are undesirable from a health viewpoint and pose a major problem for firearms instructors in indoor firing ranges, as they are exposed to an unhealthy environment each working day. To solve this problem Dynamit Nobel AG developed a nontoxic primer composition called Sintox. Lead styphnate is replaced by 2-diazo-4,6-dinitrophenol (diazole) and the barium nitrate and antimony sulfide are replaced by a mixture of zinc peroxide and titanium metal powder. The Sintox primer mixture contains tetracene, diazole, zinc peroxide/ titanium powder, and nitrocellulose ball powder.53 The use of this primer coupled with a totally jacketed bullet (base also enclosed) entirely eliminates the health hazard problem. The use of titanium as a replacement for calcium silicide in conventional Sinoxyd primers is being investigated by Dynamit Nobel. Since they were introduced, lead free primers have improved to the extent that their performance rivals that of conventional lead-containing primers which they will probably replace in the near future. Primer mixtures can be divided today into six categories: (a) mercuric and corrosive, (b) mercuric and noncorrosive, (c) nonmercuric and corrosive, (d) nonmercuric and noncorrosive, that is, Sinoxyd type, (e) Sintox type, that is, lead free, and (f) miscellaneous (unusual priming compositions). 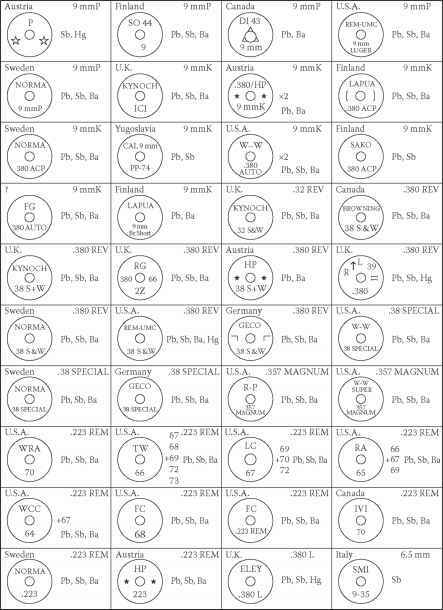 Two-component primer compositions (based on lead and barium compounds) are more common than three-component types (based on lead, barium, and antimony compounds) in rimfire primed ammunition. However, three-component rimfire primers are far from rare. Some manufacturers use both two- and three-component primers in their range of rimfire ammunition. Primers are not used exclusively for firearm ammunition, but have other uses which include blank cartridges, flares, flare trip wires, mortars, pyrotechnic cartridges, hand grenades, rocket-propelled grenades, ejector seat mechanisms, jettison devices, and other larger ammunition components. What is a priming composition? What is the chemical mixture for pistol primer? What is composition of .22 primer? Is red phosphorus found in rimfire primer composition? What is composition of prming mixture? How is zink used in world war ammunition? What is the chemical used in eley primers?